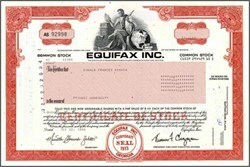 Beautifully engraved certificate from the Equifax Inc. . This historic document was printed by the Security-Columbian United States Banknote Company and has an ornate border around it with a vignette of an allegorical man with a globe. This item has the printed signatures of the Company’s President and Secretary. 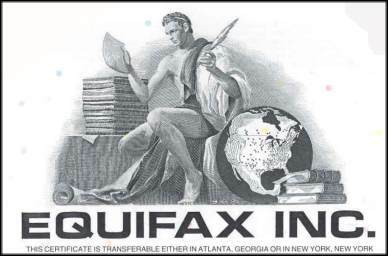 Equifax enables and secures global commerce through its information management, consumer credit, marketing services, business information, authentication and e-commerce businesses. As a leader in information services, Equifax adds value wherever customers do business, including the financial services, retail, healthcare, telecommunications/utilities, information technology, brokerage, insurance and business lending industries and government.